Especially, as of December 31, 2015, the cumulative debts of the parent company Vinalines fell to VND6.18 trillion ($294 million), down 46 per cent compared to two years ago when it spiked to VND11.4 trillion ($524 million). In 2015 alone, Vinalines succeeded in reducing its debts by nearly VND4.5 trillion ($206 million). According to Deputy Minister of Transport Nguyen Van Cong, although Vinalines’ profits in 2015 were still modest, particularly considering the company’s return on revenue ratio, this is a boost that “could not be better” for the company’s upcoming initial public offering (IPO), slated to take place right in the first quarter of 2016. Earlier, by the end of December 2014, Minister of Transport Dinh La Thang approved Vinalines’ 2013 enterprise value of VND21.2 trillion ($976 million), including the state capital value of VND8.96 trillion ($411 million). According to Vinalines’ recent assessment, the shipping business line continued to pose big challenges to the company’s operation this year, after the Baltic dry index (BDI), a measure of the price of shipping bulk cargoes around the world, had fallen to just 474 points by late 2015, a 31-year record low. This situation is forecast to be even more critical this year. Meanwhile, Vinalines’ shipping fleet, sporting a total carrying capacity of 2.15 million tonnes and making up one fourth of the national shipping fleet, has yet to tackle its inherent weaknesses. Serious concerns arose over issues such as old-age, high operating costs, and unreasonable ship structures (lack of container ships against a glut of bulk carriers). This has made restructuring the firm’s shipping fleet a crucial task this year, to boost the company’s operating efficiency. Shipping firms under Vinalines are therefore set to sell inefficient and aged ships with a total carrying capacity of about 400,000 tonnes right this year. “The greatest difficulty in restructuring Vinalines’ fleet is their initial high investment cost, as they were mostly bought when the shipping market was peaking (2007-2008). If we wait until the market recovers, the ships could get older and pile on high maintenance costs. 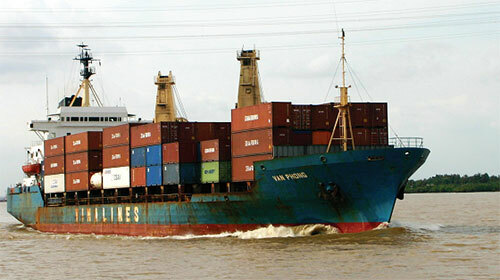 We, therefore, must accept to sell several of them to reduce the financial burden,” said a Vinalines executive.